The Cheerleader, a Norman Rockwell painting , appeared on the cover of The Saturday Evening Post published November 25, 1961. This is another timeless favorite of Rockwell collectors, a classic for all the ages. This painting was Rockwell's 316th overall out of 322 total paintings that were published on the cover of the Saturday Evening Post. Rockwell's career with the Post, spanning 47 years, began with his first cover illustration, Boy With Baby Carriage in 1916 and continued through his last, Portrait of John F. Kennedy, in 1963. This was also the third cover for The Post in 1961. In 1961, there were three Norman Rockwell Saturday Evening Post covers published. The original acrylic on wall board painting, 35.125 x 34.125 inches or 89 x 86.5 cm, is part of a private collection. on page 232 of Norman Rockwell, A Definitive Catalogue by Laurie Norton Moffatt. Ten studies are also reproduced in Norman Rockwell Catalogue on pages 232 through 235. 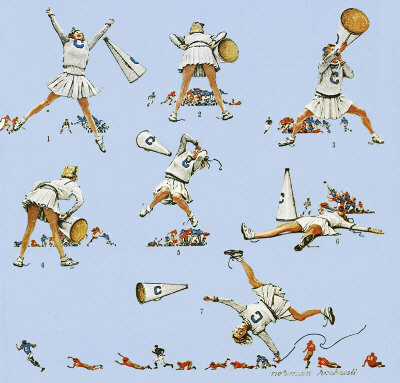 Norman Rockwell shows the ups and downs of cheerleading in this painting. Always topical, Rockwell painted this series of pictures to appear at Thanksgiving, during the stretch of Footbal season. Of course, football had not become the spectacle in those days that it has become today. She starts out jumping with joy and cheering her heart out. Then she watches the game for a minute or two. The she tries to get the home crowd involved in her cheering. She sees a play in which the home team gets the worse end of it. She cringes and jumps in dismay. Things go from bad to worse and she falls down backwards. The Cheerleader was only one of 322 Norman Rockwell Saturday Evening Post covers; Here is the list of Norman Rockwell Saturday Evening Post cover illustrations. The last scene shows the running back for the home team breaking many tackles and scooting away for a touchdown. The Cheerleader turns a cartwheel. Her hair ribbon has steadily been coming untied. No matter. Her team is winning and she uses her ribbon to show her joy. Rockwell uses the hair ribbon to frame and emphasize one of the visiting team looking on at the touchdown..
Do You Have A Great Story, Opinion Or Contribution About The Cheerleader?